Sunday already? 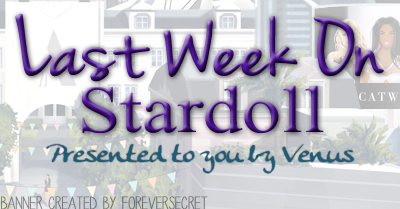 Seems like this week has gone so fast, yet nothing much happened, neither in my real life or Stardoll. But that may be a good thing, not much releases means not much stuff to spend money on, which leaves you with more to spend on promoting your doll for MSW. If you decide to participate, of course. But enough with intro, here goes another recap by yours truly. On Monday, we (finally) got a new MSW store. Whether you like this year's MSW contest or not, you have to admit this collection is truly gorgeous. A variety of stunning short and long dresses, interesting shoes and some pretty and quite useful clutches. Also, all Superstar/Royalty users have a 10% discount on a store - not just the users who got 3+1 ss months offer, but all paying members. Some pieces seem to be missing, like the ones on offer/payment page, but people are guessing that they will arrive soon, probably in a new floor of a MSW store. My guess is, that as the previous years, MSW clothes will not become sellable even after they leave the store, so you better buy stuff you like. No need to hurry though, MSW won't end soon. On Wednesday, as expected, we got another Callie's Picks collection, this one named "Grunge Glam"
The theme is similar/same to latest LE collection, although many members suggest that this collection matches term 'grunge' better than LE. It is more affordable too. Great for fans of the particular style, or users who love to experiment with styles and have their virtual wardrobes filled with all sorts and types of clothes. There may be a few rares in the collection, but nothing spectacular. My favorite is a blue/black Kohl's dress, as I really loved the store and I hate that I did not buy anything from it. There is also a cute star shaped bag, and that black corset top, which I sold original for - well, not much, 30 stardollars. But overall, not a big fan of a collection, or either the style overall. And on Friday, we got a new collection of Mawi jewelery. Considering that the prizes for top 3 MSW 14 winners are real life Mawi jewelery/accessories, no wonder Stardoll decided to release collection inspired by particular store. This time, we got some cute clutches too, aside from usual jewelry. There was a nice glitch where one clutch cost 11starcoins in stardollars. Though some users didn't get it in time, and got charged stardollars. Also, not so nice glitch of making prices 999 sd/sc. Both were fixed quickly, so not a big issue here. Items are nice, and I think Mawi is great jewelery store. But I am more a fan of stuff that goes to our suites, not beauty parlors. One more thing - what's with all those robots? The end. Yeah, told you, slow week. Hoping for some nicer stuff next week, possibly some updates. Don't get too high hopes though. Just vote on a poll, leave a comment if you wish, and see you next week.